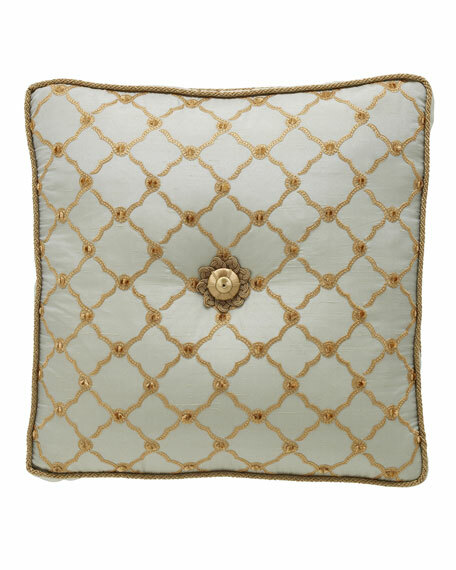 Dian Austin Couture HomePetit Trianon Tufted Pillow, 18"Sq. EXCLUSIVELY AT NEIMAN MARCUS Velvet pillow with twisted cord finish. Silk buttons at front. Front, back, and fill: polyester. Zip closure. Dry clean. 17"Sq. Made in the USA of imported materials. EXCLUSIVELY AT NEIMAN MARCUS Pieced pillow with button center. Twisted cording finish. Zip closure. Front: silk/polyester. Back and fill: polyester. EXCLUSIVELY AT NEIMAN MARCUS Pieced pillow with button center. Twisted cording finish. Zip closure. Front: silk/polyester. Back and fill: polyester. Dry clean. 12" x 16". Made in the USA of imported materials. Pieced square pillow with rosette center and ruched silk corners. Finished with twisted cording. Silk/polyester/viscose front; cotton/polyester back; polyester fill. Pieced square pillow with rosette center and ruched silk corners. Finished with twisted cording. Silk/polyester/viscose front; cotton/polyester back; polyester fill. 18"Sq. Dry clean. Made in the USA of imported materials. EXCLUSIVELY AT NEIMAN MARCUS Pieced boutique pillow with floral center and silk accents. Front, viscose/polyester/silk. Back and fill, polyester. Twisted cording finish. Zip closure. 18"Sq. Dry clean. Made in the USA of imported materials.